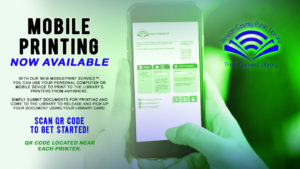 Your Rowan County Public Library offers mobile printing! Did you know that you can use your personal devices to print to our printers from anywhere? Just follow the directions below to send your files straight to our printing station from your smartphone, tablet, laptop, home computer, or whatever! Start by clicking here to visit our mobile printing page (as with most links, you can right-click to select “open link in a new tab” or similar, if you need to). Choose our black-and-white or color printer at the left, then enter your email address in the center box. Copy and paste the URL of an online file you wish to print in the box on the right, or click the button labeled “browse” to search for a local file on your computer. Click the green printer icon. You’ll see the status of your print job and a reference number. You’ll need to come see us to complete your print; from here on out, it’s just like printing normally from one of our computers! Simply visit our print release station, select “release a print job,” and enter the email address you supplied when you sent your file to be printed. You should see your file waiting to be printed; enter the appropriate funds in the coin and bill acceptor to the left of the print station, select your job, and choose “print” in the top left-hand corner of the screen to finish up! Start by visiting the Google Play Store (for Android devices) or the App Store (for iOS devices), and search for the PrinterOn app by PrinterOn Inc. There are a couple of different apps by this company for different purposes, so make sure to choose the one that just says “PrinterOn,” and nothing else! After installing the app, start it up and adjust the initial settings by choosing “no printer selected,” down at the bottom of the screen. Once you’ve found us by name, choose either our black-and-white or color printer. You’ll automatically be taken back to the app’s main screen. 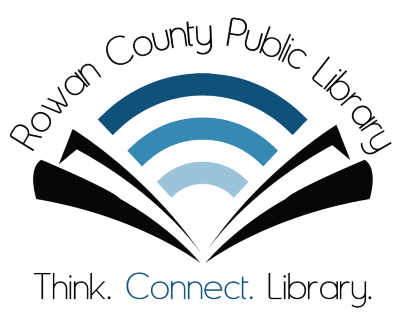 Please Note: We’re listed as “Rowan County Public Library RCPL Kentucky,” because there’s another lovely library that’s also called Rowan County Public, over in North Carolina, with whom we sometimes get confused (our secret rivals, but don’t tell them that!). You’ll want to make sure you’re sending your prints to us and not to them, unless you feel like driving quite a long way to pick them up! To print, choose “documents,” “photos,” or “web.” For documents or photos, simply pick the file(s) you’d like to print from your device. For webpages, enter the URL/web address. Select the printer you saved and click the print icon. To finish up, come see us at the library and go to the print release station, where you’ll need to select “release a print job,”and enter the email address you supplied when you sent your file to be printed.